The wild form of Senecio cruentus is a perennial with purple flowers although it is now usually grown as an annual. Many cultivars are available, and were in Victorian times, in a wide range of shape and form but mainly in shades of blue, purple, white and magenta. It is uncertain if other species were involved in the development of the florist’s cineraria. [RHSE, Hortus]. Extensively grown as a pot plant in Victorian times. 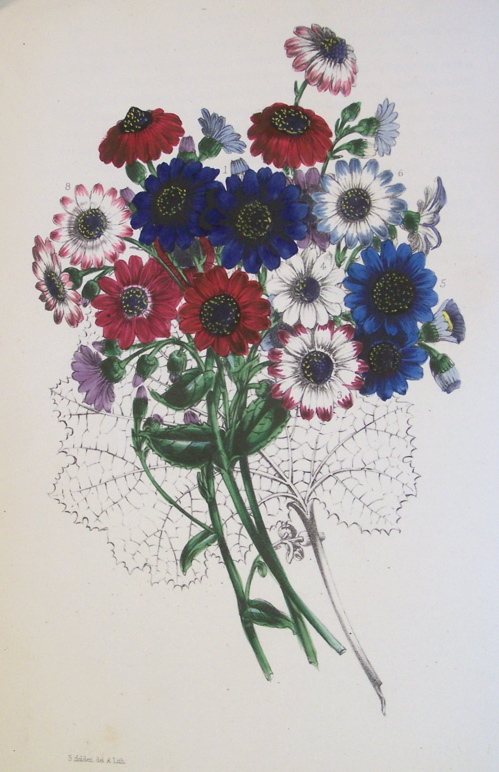 Johnson's Dictionary gives the origin of the florists’ cineraria as Cineraria malvaefolia (malvifolia) L’Hérit., introduced in 1777, C. lanata L’Hérit., 1780, C. populifolia prob. L’Hérit., 1780, and probably some others, all from the Canaries or Azores, but this is not the generally held view. Curtis's Botanical Magazine figures Cineraria cruenta L’Hérit. : ‘Of the many ornamental greenhouse plants introduced by Mr. Masson [from the canary islands in 1777], this is one of the most desirable; as a shewy plant, it has indeed few equals.’ [BM t.406/1798),]. Andrews' Botanical Repository figures Cineraria aurita Andr., synonym C. cruenta. [ABR pl.24/1798]. The British Florist figures three varieties of cineraria: perfecta, purple with a paler centre; nobilis, white, the petals edged with pink; sapphire, deep blue, very similar to modern hybrid cinerarias. [BF pl.73/1845]. ‘Hybrid cinerarias are now becoming so numerous that it is with difficulty many of them can be distinguished from each other; and the yearly addition of such numbers of new ones tends to add to the confusion of those who desire to gain a knowledge of their peculiarities.’ Cineraria Webberiana is figured with deep blue flowers, the petals paler at the base. [MB p.126/1842]. This journal commented in similar vein three years later: ‘It is not many years since the old Cineraria cruenta and 1 or 2 others were nearly the only plants of the class cultivated in gardens: at the present day, through the industry and skill of the florists, the varieties are become almost innumerable, and are so much improved in all the qualities usually esteemed in plants, that no one now thinks of retaining the original species, except merely as botanical curiosities.’ [MB p.149/1845]. Listed in the 1850 and 1857 catalogues [H.79/1850]. It is probable that Cineraria seed was obtained from James Carter, Florist and Seedsman of High Holborn, with whom an order for ‘the finest’ Cineraria seed was placed on 8th of April 1846 [ML A2933-1, p.128]. Carter’s seed would certainly have been obtained from then very popular improved varieties. Macarthur also ordered seed, ‘very splendid mixture’, from Hurst and McMullen, Seedsmen and Florists, London, on 8th April, 1846 [ML A2933-1, p.132]. Cinerarias clearly became an important ornamental plant at Camden Park, at least in the later years of the 19th century, as the single surviving greenhouse in the glasshouse complex is marked ‘Cineraria House’ in an 1890 garden plan. Florist’s Cineraria: ‘Flowers round; petals broad and thick, smooth in texture, and blunt at the ends. sitting very close; centre small; colour bright or dense; and the outside of the pip free of notches.’ [FC p.9/1848].